‘DataSpace Office Live’ is the most advanced of our local authority Submit-a-Plan accounts. It comprises all the core tools and functionality for receiving and processing applications submitted electronically through Submit-a-Plan as well all our specialist modules for assessing and approving them online in DataSpace Live. With 'DataSpace Office' you'll be able to manage and carry out all your inspection, consultation and plan-checking tasks in one place as well as sharing folders of application documents and other information with consultees or other contacts straight from DSLive itself. 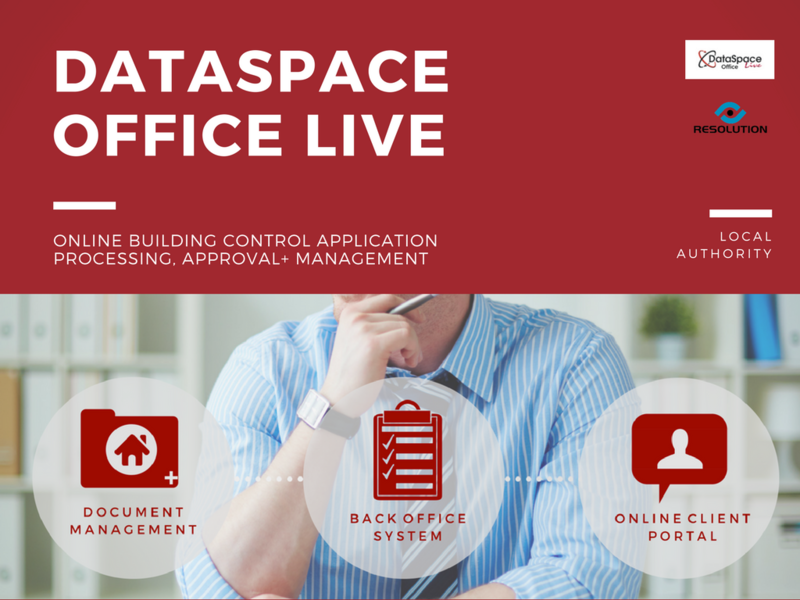 DataSpace Office Live provides all the functionality for receiving and managing your building control applications. While Submit-a-Plan makes it quick, simple and efficient for public and professional applicants to instantly submit applications with further additional or revised documents to local authorities, DataSpace Live enables authorities process, approve and manage them. With our specialist application scanning and import services, all your applications and data can be stored and managed electronically online in DSLive. This account gains its name of 'Office' because in addition it aims to provide solutions to all your department's administrative and management tasks with a set of sophisticated and bespoke tools that are unrivalled in the industry. With the aim of replacing the need for a separate Back Office system, you will be able to register, assess and approve all applications in DSLive as well as creating and sharing certificates, notices and other documents with applicants and other contacts. Meanwhile DSLive Reports enables you to create detailed reports on the applications, inspections and plan-checking in your DSLive account to monitor and review the work and money coming in to your department(s). DataSpace Office even enables you to organise the working method of your department(s). Assign officers to specific applications or use our ‘Application Workflow’ tool to determine the route a newly submitted application progresses through your team(s) depending on the attention it needs. DSLive and its modules are also accessible from any location with internet access, facilitating flexible working for desk-sharing or for those team members who work remotely or from home. This also provides a much needed solution to the increasing need of authorities to externalize plan and structural checking activities to outside providers while at the same time preserving the confidentiality of sensitive application information. Finally DataSpace Office is also ideal for local authority building control partnerships or trading companies, not only enabling them to manage the receipt and approval of the numerous applications submitted to them but to solve many of the issues that emerge during the forming of a partnership, such as the need for remote working, for sharing application information, for monitoring and reporting on performance or the need to change the way they manage their department and application data overall. 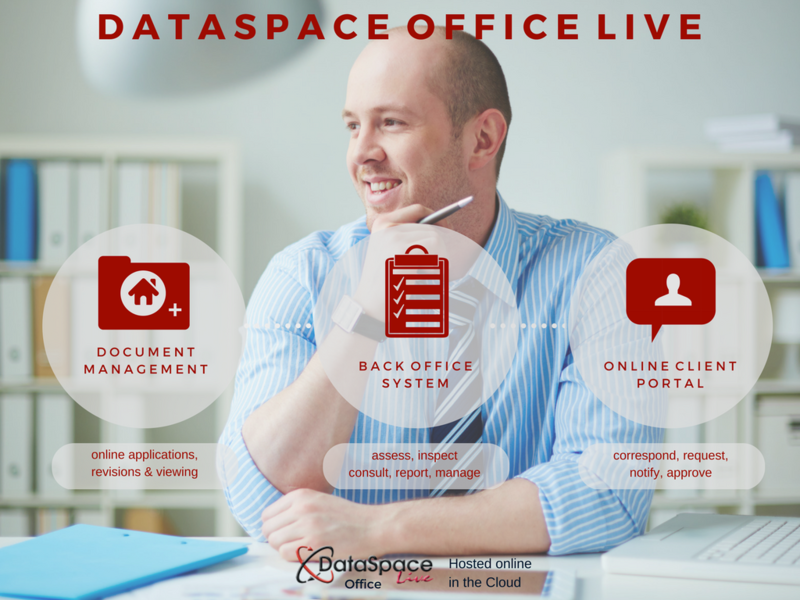 Designed to improve efficiency of service in all areas, DataSpace Office Live also comes with an advanced client portal, enabling you to share approved documents, certificates and notices, inspection reports and plan-checking results instantly through the portal. In addition applicants and agents can upload additional or revised documents, request inspection visits, gain pre-application advice and submission, carry out online application payment, track the status and activity of their application and contact the authority by email directly from their account among other things. Facilitates flexible access and working for team members who work remotely or from home and or consultees and freelance plan-checkers. Applicants and agents provided with advanced online client portal for submitting and tracking applications and additional/revised documents as well as receiving approved documents, certificates and notices and reports and results related to the inspections and plan-checks that have been carried out. In addition applicants and agents can upload additional or revised documents, request inspection visits, gain pre-application advice and submission, carry out online application payment, track the status and activity of their application and contact the authority by email directly from their account among other things.